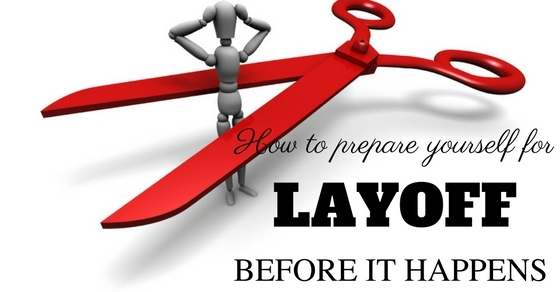 How to Prepare for a Layoff Before It Happens? Do you feel lucky about landing in your current position (job)? Well, if you do then it is great. However, did you ever thought about the amount of unemployed skilled labors (job seekers)? Yes, there is a possibility that there are plenty such people who are more qualified and deserving than you. When this thought strikes you, do you feel insecure about your position and performance? Do you doubt your future in the present workplace? Well, then somewhere it is an indirect pointer to the fact that ‘you might be laid off soon’. May be it is not so but you should always be preparing for a possible layoff. So, what kind of preparation is to be done and how? Well, think about it as an employer. What criteria would you follow when it comes to hiring and firing your employees? If it were I, I would have definitely looked upon certain things apart from the usual performance draft. After all, I feel, several other things are equally essential and important for the company. Let us have an in detail look at those aspects. Whom do you trust the most? With whom do you share your secrets? Well, secrets sound a little too extreme but you get the point. You need to be that one person, that one name which will appear first, the second your boss needs any help. By being trustworthy, I mean to highlight the fact that you need to be more social and frank with your boss. The more he or she sees you at help, the more trust you are bound to get. Well, believe me or not but this trust will definitely lessen the odds of you being fired or laid off. Try to be the boss’s man (in other words- boss’s right hand) and enjoy the boon that comes along with it. This is where most employees fail. In order to be the boss’s man you first need to be visible. You need to be visible and show the intensity and amount of hard work and sincerity that you hold for the current position. Imagine the situation of a layoff. The company cannot blindly hire and fire people. It is a huge process; here the employer checks the salary, performance and behavior of the individual, benefits (of keeping you at the job). Depending on those aspects, the employer may come up with a decision. A layoff situation does not mean that the employer may layoff the entire staff. Usually the cut off is of 30-40%. Considering the percentage, at least 60-70% employees can keep the job. Well, you need to assure that you are in that 60-70%. Keep working on your performance, be the frank one (as described in point 1), be punctual, get your work done well. This will definitely highlight you and make you visible enough in the eyes of your superiors. Do you remember that kid who used to sit silently in the class (as if he never existed)? Can you name that person or remember him? Well, if it has been years since your farewell at school, I bet that you faintly remember anything about him. While at the same time, you would definitely remember the scholarly-one, the backbenchers, and the funny ones. Why do you think it happens? Well, the answer to it will make you realize the importance of being active and alert. Those memorable set of people managed to engrave them in our mind whereas the silent one never made it that far. Similarly, when in meetings, be well read about the issue and speak up when you can. This will not only shift the focus of your employer onto you but also portray your skills like the ability to understand the problem and providing solutions to it. Moreover, it will show your leadership skills. However, do not blabber about something without having any knowledge of it. Unnecessary inputs and disturbance may prove to be hazardous for you. Layoff is a situation that arises due to some kind of failure of the company. To lessen down the amount of loss the company decides to pull off some workers. In this situation, they always think of getting rid of people who do not make much difference to the company. In that case, you need to show how much difference your absence will create. Always be active and work extra when needed. More workload will give you more opportunities to shine and show them what you can do. Failure is the stepping-stone to success is a very famous English proverb. It means that you learn from your mistakes. Your mistake helps you to get better the next time. Thus, the first step towards success begins with accepting the mistake. Accept your mistake and pledge to get better. Well, someone can make a place in my ‘keep for the company’ list through those few ways. However, not everything is possible. Due to some reasons, one may not be able to work extra hours. May be your introvert nature keeps you from showing your almost invisible leadership quality? Well, even after reading the above list if you still feel doubtful about your future in the workplace then you might have to prepare for the possible layoff (which you might experience in near future). Got laid off what to do next? How to deal with being laid off? Well, start slowly but before you are laid off. The sooner you do it the better you would get. Start preparing for things before falling into the panic stage of ‘the laid off employee‘. People have this lazy attitude towards stuff. However, it is time like these when they realize the importance of updating various things within the resume. When you are hired for the current job, you came with certain skills at your hand. Over the course of time, while working in the company, you are bound to get experiences or any type of achievement. You need to update the new learnt things in your current resume. Brush up your resume with detailed information of the achievements and experiences according to the time. It is a very common thing to forget. Well, when you are in the panic stage it becomes harder for you to think of anything properly. Therefore, all the lazy ones should start updating the list before they enter the panic stage. Brush up, polish your resume, and be ready. Years ago when you landed your current job, you automatically got an access to the innumerable contacts from the same field. Over the course of period, slowly and gradually keep networking with these contacts. One may never know which of the contacts may prove to be beneficial in landing a new job. By networking, I do not mean to ask you to limit yourself with the face-to-face contacts. With the advent of technology, many social networking sites have knocked on our doors. Along with these sites comes new opportunities’ knocking at your door. Make use of sites like LinkedIn, monster.com etc. I would like to sum it up by simply stating that keep networking. 21st Century is indirectly a blessing for the job seekers. The ‘everything available online’ factor has changed our lives tremendously. If you are, feeling a bit confused about some written steps on Google then you always have an option of YouTube for visual tutorial. Similarly, one or the other way, we have an option for jobs too. CareerBuilder, shine, freelancer, indeed jobs, naukri.com, monster.com, etc. are some of the sites that you need to surf through them. Thus, start searching and applying for jobs. This will give you possible assurance as well as something to be positive about in your current situation. Positivism is also an important factor to hold onto during these times. Acquiring new skills can be fun. As a fact, new skills, when incorporated with the old ones can benefit you greatly. Think about using the available sources within the workplace to boost your skills. It will be like killing two birds with one stone. Taking up courses online is another way to enhance and polish the skills. In addition to learning new skills, do not forget the old ones. We learn and incorporate many skills consciously or unconsciously. Some of these skills, which remain unused for long term, may start to deteriorate. Thus, use this time to polish the old ones that you were not able to use. Make a list or set of skills (include every possible skill that you can think of). After making the list, make an inventory about the list of skills you have, the list of skills you need to work on and the list of skill you need to learn. This will make it easier for you to work on them. Calm yourself down and keep working. Once you have prepared for the new job search process, focus on other things too. With your job, being laid off your financial condition will also change accordingly. You need to prepare for the financial aspect also. How would you prepare for that? Well, do not get anxious because here are a few tips that I would like to share. Preparing Financially For A Layoff? The first and foremost priority before a layoff is to prepare an emergency fund for you. We all have a bit of savings stored here and there. A saving program or agenda is necessary before facing any layoff. This emergency fund will decide your survival. The more you have stored for yourself, the better you will be able to carry on during your job search period. Expenses can hardly be avoided in today’s time. Cutting down some of the entertaining sources is a tough job. However, during the laid off or the unemployed period you need to make a compromise with your luxury. In this period, your savings are your only savior. Thus, you may want to cut short on things like television cable, magazine or newspaper subscription, gym membership, regular weekend outings, weekend bar party, etc. This little or in your case a huge change will benefit a lot in keeping you going for a little more time during this crisis. A few months’ suffering would only give you a good experience and something to learn a lesson from in the future (Lesson on how to deal with crisis). Yes, you read it correctly. You need something to keep going. Emergency fund will deteriorate and leave you bankrupt or in debt. Thus, do not hesitate to apply for any part time job. These little part time jobs may give you more experience along with the salary. Try to turn your hobby into your part time career. This will lessen your dependence on emergency fund and will give you a chance to work on your hobby. Yes, foresight is important. By saying foresight, I do not expect you to predict the future. I mean to say is prepare your household against the laid off period. Moreover, keep some cash reserved for emergencies and other important things. Thinking about foresight expenses is a precautionary step. Well, with that being said we are almost done with the preparation you need to do before a layoff. Remember layoff is just a phase and you will definitely get through it. Always have faith in yourself. If you feel negative or depressed about it then try to talk it, out with your family, friends, and/or your partner. Just remember to look at the brighter side always.